Coke Fest 2018 Coming To Karachi on 14th December. After the successful musical and food event in Lahore and Faisalabad the Coke Fest 2018 is all set to kick off in Karachi in December. 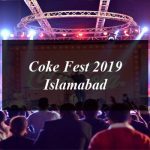 In Lahore the Coke Fest 2018 event was organized on 18th November, 40km away from the hustle and bustle of the main city but that didn’t stop the 250,000 Lahoris who gathered to the event. In Faisalabad the Coca-Cola food and music festival kicked off in Faisalabad on 1st December. The two day event in Faisalabad was one of the best events in the city in recent times, just like the ones celebrated in Lahore in association with Coke and Jazz. Coke Fest 2018 in Lahore and Faisalabad was the true fusion of food and music. 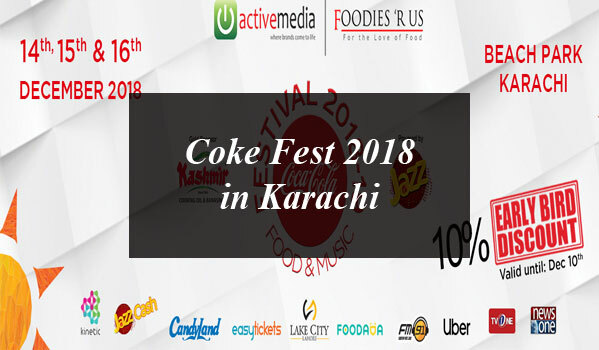 Now the Coca-Cola food and music festival all set to arrive in Karachi on 14th December and it will enthrall the food and music lovers for the complete three days with the mouthwatering foods of the local chefs at discounted rates. The music at the event will be played by the renowned singers and musicians from Coke Studio including megastars such as Maria Meer, Jawad Ahmed, Malkoo, Amanat Ali and many others. The Coke Fest 2018 in Karachi will be in the Beach Park. How to buy Tickets For Coca-Cola food and music festival Karachi? 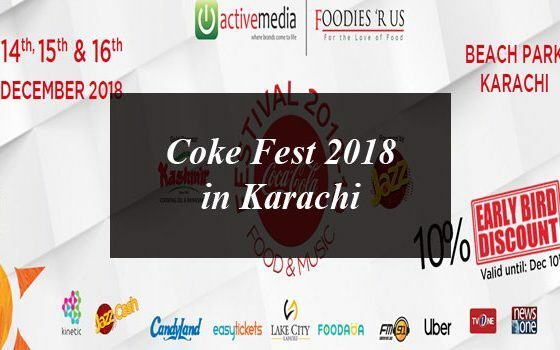 You can buy the ticket for the Coke Fest 2018 Karachi for Rs. 405 each. You can buy the ticket on easy ticket website. So what are you waiting for get ready with your friends and family to enjoy the Coke Fest 2018 with delicious foods and mesmerizing music. Coke Fest 2018 Event is headed to Karachi. Coke Fest 2018 Coming To Karachi on 14th December. After the successful musical and food event in Lahore and Faisalabad the Coke Fest 2018 is all set to kick off in Karachi in December.